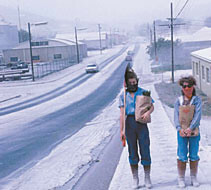 Ashfall is the volcanic hazard likely to affect the greatest number of people in the Pacific Northwest during a volcanic eruption. Though falling ash is not typically life threatening, it can impact our lives in many ways. Volcanic ash does not have the same properties as ash from a fire. Volcanic ash is comprised of fine particles of glass which make it much denser and heavier than one might think. Just 20 centimeters of ash can cause structures to collapse. Particularly to the east of the Cascade Range, the systems for which we get our water supply are open to the air in the form of rivers and reservoirs. Falling ash can contaminate and clog these systems. Falling ash can also smother crops. Because of its interesting properties, volcanic ash can also cause lightning storms and fires and small deposits on electrical transmission equipment can short circuit transformers and power lines causing power outages. 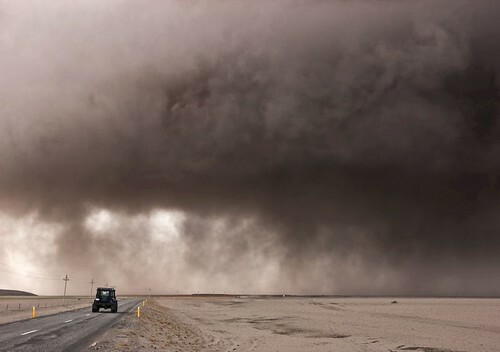 Volcanic ash also clogs internal combustion vehicle engines' air filters. But without air filters the fine glass particles could enter the engine and quickly erode and destroy the precision parts. Small amounts of ash in the atmosphere also interferes with aircraft. The susceptibility of aircraft that might fly through an ash cloud is a major driver of real-time monitoring of volcanoes even in regions where little else is at risk. The airspace potentially impacted by an ash cloud from any of the Cascade's 9 dangerous volcanoes hosts thousands of guests just passing through on billions of dollars of airplanes each day. Therefore ash hazards have their own special alerting systems. More info? Check out what the USGS has to say.